Chaharmahal & Bakhtiari province, with the area of 16328 square kilometers, is the 25th province of the country in terms of area and borders on the provinces of Isfahan, Lorestan, Khuzestan and Kohgiluyeh and Boyer-Ahmad. 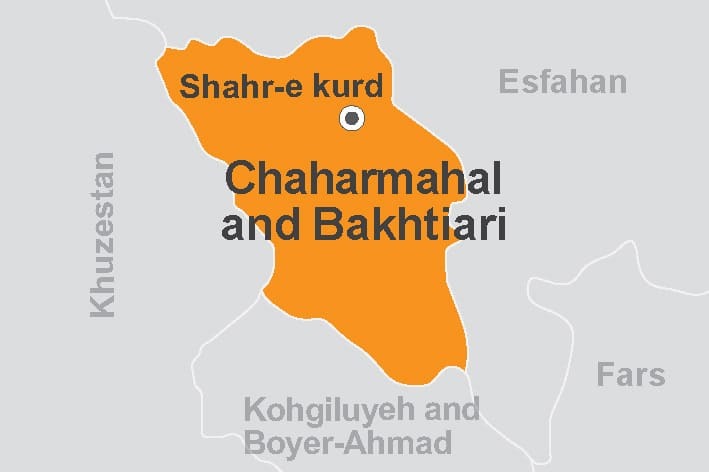 Chaharmahal & Bakhtiari has nine counties and its center is Shahr-e-Kurd (formerly Deh Kord). The province consists of two parts: Chaharmahal and Bakhtiari. Chaharmahal is interfacing between Isfahan province and the Bakhtiari tribe district and consists of four areas: Lar, Kiar, Mizdej and Gandoman. The people of the province are also divided into the inhabitants of Chaharmahal and Bakhtiari. The common languages in Chahar Mahal are Persian with local and Turkish (in some places) accents and the language of Lori (Bakhtiari dialect) is common in Bakhtiari areas. Zagros Mountains cover all parts of the province and its highest peak is Zard-Kuh. Shahr-e Kurd, with a height of 2060 meters, is the highest province center of Iran and therefore it is called “Roof of Iran”. Two major rivers of Zayanderud and Karun originate from the mountains of this province. In terms of climate, Chaharmahal and Bakhtiari has mountainous weather. The history of human residence in this area dates back to a few thousand years B.C. Floral and animal design of clays, copper and bronze instruments, as well as coins belonging to the Parthian and Sassanid Periods in the excavations of Kian city (former Shahrak) and several inscriptions reflect the ancient history of this province. Due to the existence of high Zagros highlands that surround all the province, it is hard and difficult to pass through this region and therefore, it has been protected from the invasion of the Greeks, Mongols, and Tatar throughout history. The remains of the castles of the Achaemenid and Sasanian eras in the Bazoft River are the evidences of this claim. Ibn Battuta, a famous Moroccan traveler in the eighth century AH, recorded his passage through these areas in his travelogue. The beautiful nature of this province attracts many tourists every year. In winter, winter sports enthusiasts find this place a popular destination for their purpose. The plains of Fritillaries, Kuhrang Tunnel Waterfall, Zaman Khan Bridge, Chaleshtar Castle, Sar Aqa Seyyed Village and natural landscapes of Zayanderud bank are other attractions of the province. The hospitality of the people of this province and roaming of Bakhtiari nomads have also boosted tourism in this province. Among the most important handicrafts of this region, it can be pointed out to the carpets, Khersak, Gabbeh, Kilim, Jajim, Choqa, Khorjin (Saddle), Musical Instruments, making lock and firearm accessories making. Bakhtiari honey, Boldaji Gaz, Kakuly (local cookie), Kashk (Curd) and Qara Qhorot (Black Kashk) are the most famous souvenirs of Chaharmahal & Bakhtiari. Most common foods in the area come from meat or dairy products, most notably Bakhtiari kebabs. Ash-e-shir (Milk & Rice), Ash-e-Mast, Ash-e-dough, Ash-e-Kashk, Ash-e-Barg (Ash-e-Reshteh), Kachi and Kufteh are native foods of the province.